Few among the thousands of vacationers who recreate on and around Lake Almanor each summer realize that beneath its waters lie the remains of a vanished way of life. This tiny Atlantis, Big Meadows, was a microcosm of the cultural forces and conflicts that racked the West in the 19th and early 20th centuries. 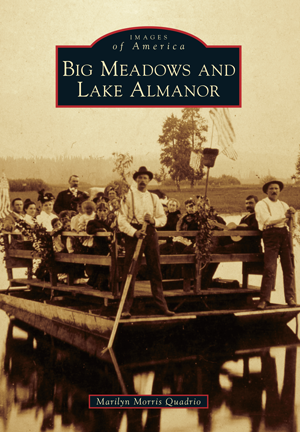 Rich in natural resources, the Meadows sustained the lives of the native Maidu and the hundreds of encroaching whites who followed on the heels of the Lassen Trail immigrant parties. White men came seeking to exploit those precious resources for gold mining, stock raising, dairying, tourism, timber, and later, hydroelectric power. In the tumult of cultural and industrial change, a pastoral way of life was lost and a native culture vanquished. Historian and writer Marilyn Morris Quadrio is part of the third generation of a family born and raised in the mountains of Tehama, Plumas, and Lassen Counties. Quadrio majored and did postgraduate studies in history. She and friend Joan Sayre have built the small Chester–Lake Almanor Museum to house a growing collection of photographs and artifacts given by descendants of pioneers.